This comes from Benriach's 11th batch of single cask whiskies and has been drawn from a single Tawny Port cask. Each bottle for this range has been carefully chosen from the stocks at Benriach and great care has been taken to ensure the quality of oak barrels that are used. Just 274 bottles were made in this case. Nose Wild red berry compote balances perfectly with warm cinnamon and white pepper. Palate Gentle red cherries with a crisp citrus kick mellow to roasted red apples and toasted spices. Colour Rich amber with a tawny heart. Types of Barrel used for Aging Finished in a Tawny Port hogshead. One of our favourite affordable whiskies. This is a great choice if you like peated Islay whiskies b..
A triple distilled single malt from Benriach Distillery which has been initially matured in bourbon ..
A delicate and smooth single malt from Benriach that has been matured predominantly in ex-Bourbon ba..
Uniquely named Septendecim which we reckon is made up latin, but intended to mean 17. Answers on .. This 17 year old replaces the old 15 year old and has also been matured Port wine pipes (barrels)..
Another great single cask bottling from Benriach. 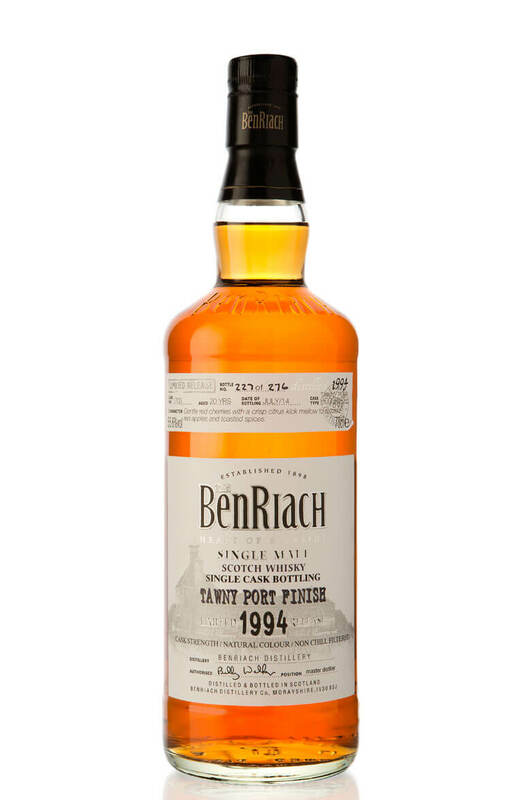 This one has been finished in a solitary Tawny ..
A superb, smoky and complex version of Benriach which is part of their heavily peated series of s..
An incredible and very rare bottling of Benriach single malt from one of the distillery's oldest ..